Heucherella varieties are fabulous, petite perennials for the woodland garden and any shady spot. Heucherella is actually a man-made genus, created in France in 1912 by botanist Emile Lemoine. 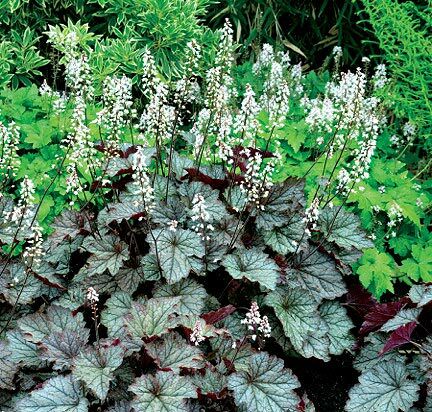 He bred the first sterile hybrid between Heuchera (coral bells) and Tiarella (foamflower), hence the botanical name Heucherella. 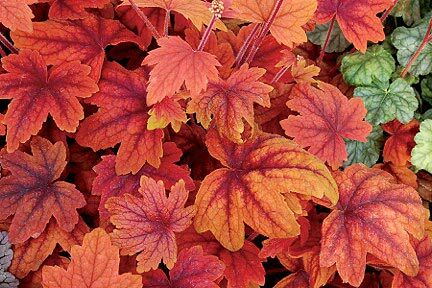 Fast-forward 103 years and today you’ll find dozens of stunningly beautiful varieties that feature the brilliant foliage color schemes of Heuchera hybrids combined with the leaf shapes, attractive flowering habit and shade-tolerance of Tiarellas. Among my favorite varieties are ‘Sweet Tea,’ ‘Solar Eclipse,’ ‘Twilight,’ ‘Alabama Sunrise’ and one of my all-time favorite perennials, ‘Stoplight.’ Don’t let my use of the word “petite” throw you –‘ Stoplight’ makes a strong impression from a block away. Plants prefer light shade to shade. They are somewhat adaptive to soil type, but will grow best in well draining soil with decent organic content, so you’ll want to add compost to the soil beneath and wide around the plant if your soil is clay or sandy. On average, varieties grow with a mounding habit 12-16” tall by 20” wide. Leaves range from 3-5”. The erect, bottlebrush white flowers rise upward to 20”, blooming in spring/early summer. The flowers attract butterflies. Use Heucherella at the front of the perennial border, in woodland garden settings and anywhere in shade where they will be seen up close. Plant as singles, in groups of three to five, and in curving swaths. Growing range USDA Zones 4-9. 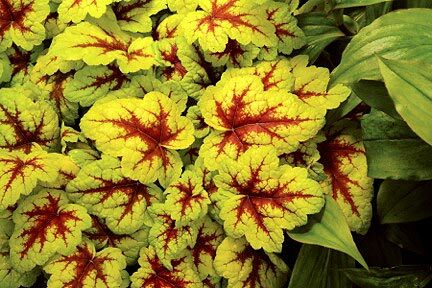 Click this link to the Terra Nova Nursery website Heucherella page; Oregon’s Terra Nova is the leading North American nursery producer of outstanding and hardy Heucherella varieties.